Home » batman , comic books , movies , the dark knight returns » Clint Eastwood as Batman... in a movie version of THE DARK KNIGHT RETURNS?! Clint Eastwood as Batman... in a movie version of THE DARK KNIGHT RETURNS?! It nearly happened, folks! While talking about their new movie The Book of Eli with MTV News, Albert and Allen Hughes revealed that years ago Warner Bros. offered them the chance to direct a film adaptation of Frank Miller's acclaimed graphic novel The Dark Knight Returns: the work most often praised for establishing the modern, grim take on Batman. In case you've never treated yourself to it, The Dark Knight Returns depicts a 55-year old decrepit Bruce Wayne, ten years past his prime, taking up the cowl once again to fight crime in Gotham City. And the Hughes Brothers' choice to play the older, "decrepit" Batman? It would have been Clint Eastwood. I think everyone who's read The Dark Knight Returns has at one point or another envisioned Eastwood playing Batman. 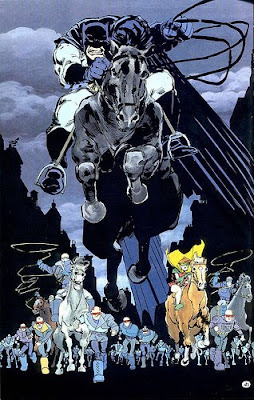 Especially with the latter part of the book when Batman and his retinue are on horseback, riding hard through the streets of Gotham: now sitting dark and helpless following the electromagnetic pulse of a nuclear weapon knocking out all the electrical power. And from the sound of it, we almost got it! Just... wow. Personally, as much as I would enjoy seeing The Dark Knight Returns get the big screen treatment, I'd much more love to see somebody take up the challenge of adapting Kingdom Come (and I'm thinking animated particularly). That is hands-down my favorite version of Batman ever.